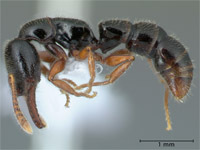 Member of the genus Amblyopone are regarded as being among the (phylogenetically) most primitive ants (Saux et al. 2004). 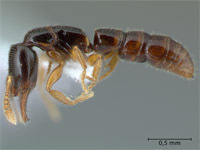 They are specialist predators on certain arthropods and some species show strong preference for geophilomorph centipedes (Ward 1988). 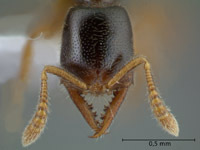 These ants seem to practice a form of non-lethal cannibalism where the queens cut a hole in the integument of the larvae and feed opon the hemolymph (Masuko 1986). This behavior does not seem to harm the larvae, which continue to grow and finally emerge as adults. Sixteen species of Amblyopone are found in the neotropical region. See Brown (1960, 1962), Lattke (1991) and Lacau & Delabie (2002) for keys to species. 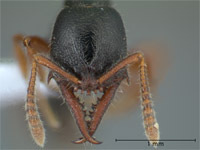 Antennae 12-segmented; lobes of frontal carina fused; anterior half of head in full face view longitudinally striat; propodeum completely black. Antennae 12-segmented; lobes of frontal carina fused; entire cephalic dorsum smooth and shining, with spaced punctures; median clypeal tooth advanced beyond lateral teeth.